It’s no secret that garaging your vehicle affords it better protection, both against the elements and other sources of potential damage. While an enclosed space is almost always preferable to open air, it’s certainly not an iron-clad solution. Indoor settings generally still allow for some amount of outside exposure, and often present their own unique threats to your car or truck’s exterior. For best results, consider an indoor car cover to protect your investment. Heat and moisture gain access through the smallest of openings, and can result in rough conditions for your car’s painted and chrome components. In the spring, airborne pollen presents a risk akin to dust, though it can be harder to remove due to its very fine and often sticky makeup. Leaves and other outside debris can easily travel inside each time a garage door is opened. Not only is this a problem for your car’s immediate appearance, these particles also tend to leave tiny nicks and scratches, degrading finishes even after they’re removed. While preferable to outdoor storage, garages usually have their own sets of challenges to deal with. Kids with busy hands and pets with sharp claws pose risks to a flawless vehicular finish. Consider also any work that may be performed near a stored vehicle—spark-producing tools, harsh cleaning products and good old-fashioned dust are just a few of the concerns to keep in mind when storing your automobile inside. A good cover is designed to provide your vehicle ideal protection for the environment. 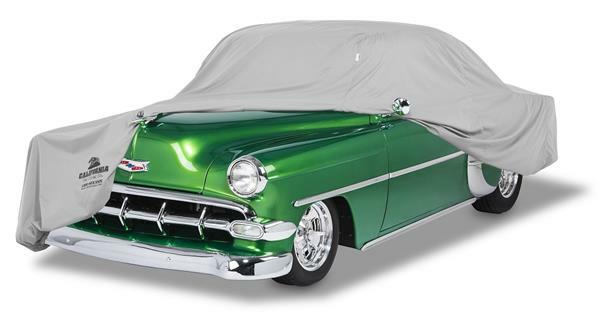 California Car Cover Co. specializes in custom-fit solutions that are soft, breathable and tailored to the shape of your ride for maximum protection against all the most common indoor hazards.